First debuting in 2013, our Turbo Wheels have been THE wheel of choice for our World Champion Sk8Kings racing team. Offering traction, speed and predictable slide control - Turbos have helped our team riders to the podium in races worldwide ever since! Our original ST (SpeedTrak) formula is awesome and our latest SS (SuperSpeed) urethane formula kicks up the speed potential even more - while still maintaining that excellent grip quality our Turbos are known for. 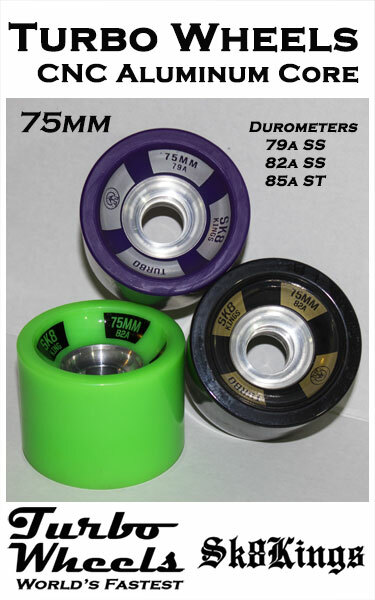 Bearing Recommendations: Turbo Aluminum Core Wheels are designed to work with traditional 8mm sized bearings. We strongly recommend using high quality bearings (such as Oust Moc 5, 7 or 9) with separate steel bearing spacers (8mm x 10mm) for best performance. Be sure to carefully align bearings and press in straight. Available Upgrade Option for Completes: Turbo Aluminum Core Wheels are an available upgrade on all Sk8Kings Axe Series, Blaster and Mini-Shredder Completes -- Woody or Ultimate! Turbo Composite Core Wheels (70mm) are included in our stock build completes.